the fitness lifestyle, I moved home to Alamo, re-certified over two years ago with IFTA, and built up my repertoire, confidence, and classes. My passion for teaching has returned! I now teach several classes at AlamoShape. I love it! I am grateful for the relationships with the women I teach and work with. I am also thankful that the new middle age is now older, and now “life begins at 50!”, because it has been very exciting for me. I’m happier and healthier than I’ve ever been. I will see you in class! Exercising and teaching exercise have been my passion since 1978, when I taught my first class! No teaching to the beat, or even to music, just calisthenics. 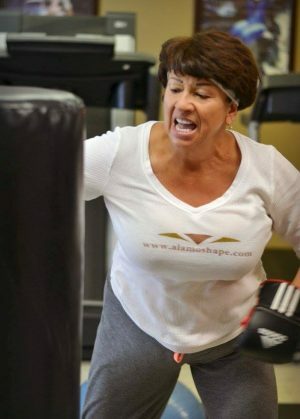 That began over 30 years as an exercise instructor. In 1985, I certified with AFFA. I taught high-impact, trampoline aerobics, high-intensity, low-impact, and step. In 1990, I moved from Memphis, TN to El Paso, teaching high-low and step, for nearly eight years at Ft. Bliss Fitness Center, and subbing all over town, until I retired from Fed-Ex. After another eight years outside of the fitness lifestyle, I moved home to Alamo, re-certified over two years ago with IFTA, and built up my repertoire, confidence, and classes. My passion for teaching has returned!